THe sponsors: Rangelands NRM through the Federal National Landcare Program, Inspiring Australia. Can bilbies and cats co-exist? This wonderful series is being run by the Roebuck Bay Working Group and Yawuru Land and Sea Unit. 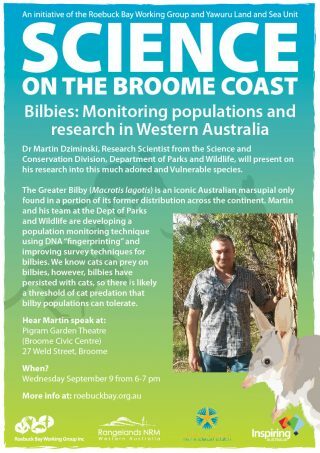 Sponsors: Inspiring Australia, Rangelands NRM, WA Marine Science Institution and Broome Shire Council.